Northern Leeward Islands and thier friends and families in the states . INFORMATION MUSIC AND SPIRITUAL WRITINGS. PHOTOS AND DOWN ISLAND GALLERIES. YACHT RACING SERIES WITH LOCAL WEATHER UPDATES. FUNNY WHAT A SCANNER CAN DO? Sunday around 1:45pm. The sea is still very rough, and the surfers are having a ball today. Leaves down, rocks in the road, but very little damage. We are the luckiest folks we know. Brazil, but lived on St. Martin. >                        U.S. VIRGIN ISLANDS, NOVEMBER 18, 1999, 4:30 p.m.
>                   Antilles during the last 48 hours. >                   landscape and water damage. >                   procedure in these circumstances. >                   was no structural damage to the hotel whatsoever. >                   implemented after Hurricane Hugo in 1989. >                   renting rooms to guests tomorrow. >                   completed in the next day or two. >                   damage, and are operating and up and running. >                   operating and up and running. >                   available on his Web site at www.donaldschnell.com. >                   and is currently welcoming guests. >                   structural damage, and is operating as normal. >                   only minor landscape damage and beach erosion. >                   are on the property occupying 62 rooms. I wanted to second Linda's message . Very little damage on St.
- USVI is fine! This article misrepresents! Hi all, apologies for any duplications. Please pass this information on. is VERY MISLEADING to the point of a complete error. business tomorrow. PLEASE CORRECT THIS ITEM! The aftermath of hurricane 'Lenny' has literally become a 'breeze' here at the house (see attached files 'house.jpg' and 'detail.jpg' below). House overlooking the located on the south side of St. Thomas, 3/4 up the hill (800 ft) and overlooking Crown Bay Marina and Water Island. Power has been on and off during the night and just came back on this morning at around 06:30. Very convenient and considerate of the local power company. Local radio keeps broadcasting reports from people in St. Croix that has suffered an onslaught of hurricane force winds for an amazing 13 hours. Despite this long period of H-force winds, the damage is NOT comparable to the destruction hurricane 'Hugo' caused in St. Croix in 1989. The reports that came in during the night and this morning all tell of scattered destruction instead of the reports of 'near-total' destruction that started to seep in after 'Hugo'. All yachts previously anchored / moored in 'Elephant Bay', 'Long Bay' and at the 'cut' at Frenchtown still there. Very, very lucky!!! 'Lenny' seems to have stalled and was at 05:00 located 83 nm ESE of St. Thomas (see attached file 'smlscale.jpg' below). 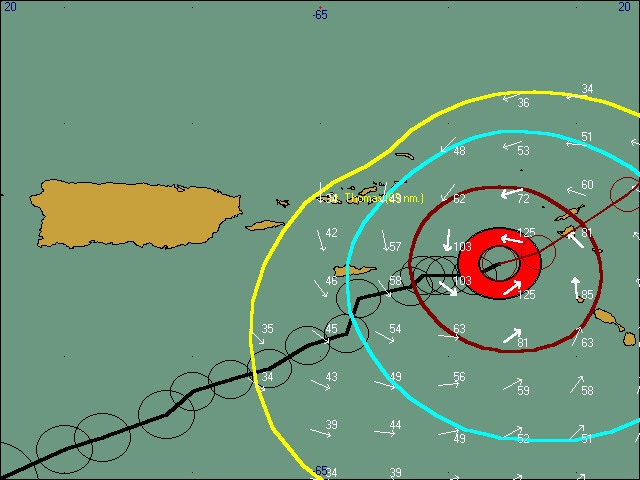 It is still a very dangerous hurricane, capable of widespread destruction on the island in its path. Don't pray, but thoughts are with Anguilla, St. Martin. Barbuda, Antigua and St. Barts. 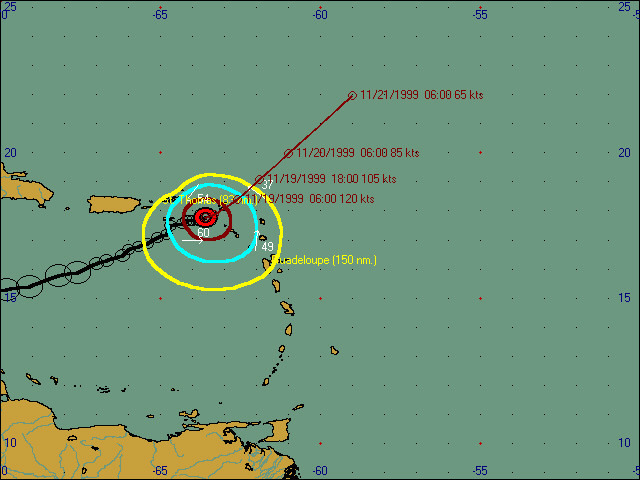 'lrgscale.jpg' shows "Lenny's" track through the Caribbean and its forecast track out of the area. Whenever that will be. Local governor on radio this morning announced the end of curfew (12:00 / noon today) might be extended due to the fact 'Lenny' is exiting the are soo slowly. Apparently, St. Croix is still experiencing winds of tropical storm force. Power at the house still on! Will be taking off / down the shutters this morning at the house as landlady, with broken (but healing now) foot, can do with some daylight. probably break anchor and the whole island will drift out to sea. ha! and Saba way, they've got it much worse than we do. - Click on "Americas" under the header "Navigate TvRadioWorld"
- Then click on "Caribbean" under the header "NORTH AMERICA"
- Select the island of choice under the header "Index By Island"
'Anguilla', 'Antigua and Barbuda', 'Saint Kitts and Nevis' and 'Saint Martin's" radio stations should be helpful in the upcoming night (and days). nearly over. The electricity is on for all of the island that I can see. 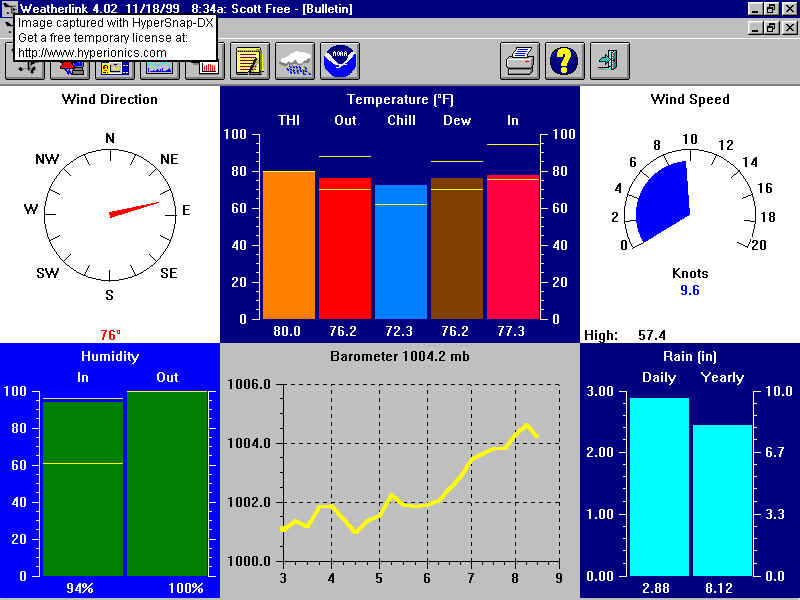 The wind was at it's strongest at about 20:00, but the surf is much lower. although I haven't had a chance to drive around the island. Good way to keep in touch.